Emmanuel Makori "AKA Ayeiya poa poa" Dies in Tragic Road Accident. - Bana Kenya News, Real African Network Tubanane. Home Entertainment Emmanuel Makori "AKA Ayeiya poa poa" Dies in Tragic Road Accident. Emmanuel Makori "AKA Ayeiya poa poa" Dies in Tragic Road Accident. Churchill show comedian died in a road accident in Lang'ata today morning. The accident happened at around 4 a.m after the live show/record at the Carnivore grounds. 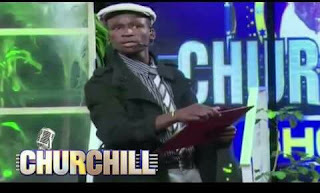 The popular Churchill show comedian "Ayeiya" Emmanuel Makori had a company when the accident took place. It is still not clear what caused the accident and investigations are underway. The police are probing the people who were eyewitnesses at that time in order to tell exactly what happened. This is a big blow to the Comedy industry and to the Churchill show (community) especially. Emmanuel Makori, popularly known as "Ayeiyaa Poa poa", died on the morning of Friday, April 14, in a road accident near the Catholic University, Nairobi. The life of an upcoming comedian and celebrity has been cut shot today. "Ayeiya" has been promoting peace to prevail in the show since 2013. From the Bana Community, we pass our condolence to the family of Makori. May God rest his soul in Peace.